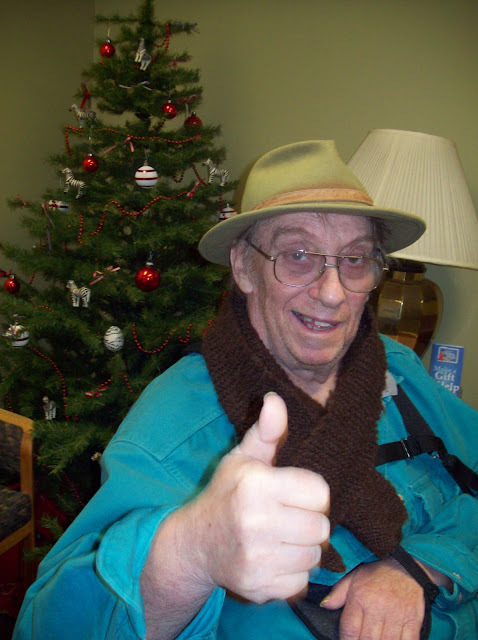 Since before Christmas, Stu and I have been traveling twice a week to Medford for power wheelchair training classes at Providence Rehab. Who knew there were such space age features in a power chair?? Sheesh! 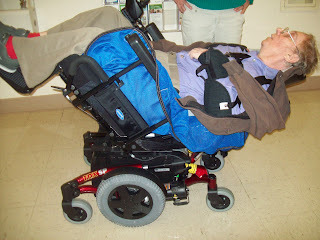 The one they're building for Stu has bells and whistles I never would have imagined----especially a handy dandy switch that tilts the wheelchair all the way back to a full reclining position! I know, it's almost unnerving, isn't it? But it's a Godsend for Stu, who has lower spine pain that prevents him from being able to sit for long periods in a standard chair. In the power chair, he is so much more comfortable. And it has been wonderful to see him engage with his trainer, Leslie----finally, something that allows him some control after so many months of utter helplessness! He is both encouraged and exhausted at the end of the hour lessons----it's hard work re-training your brain! He has noticeable neglect on the left side. 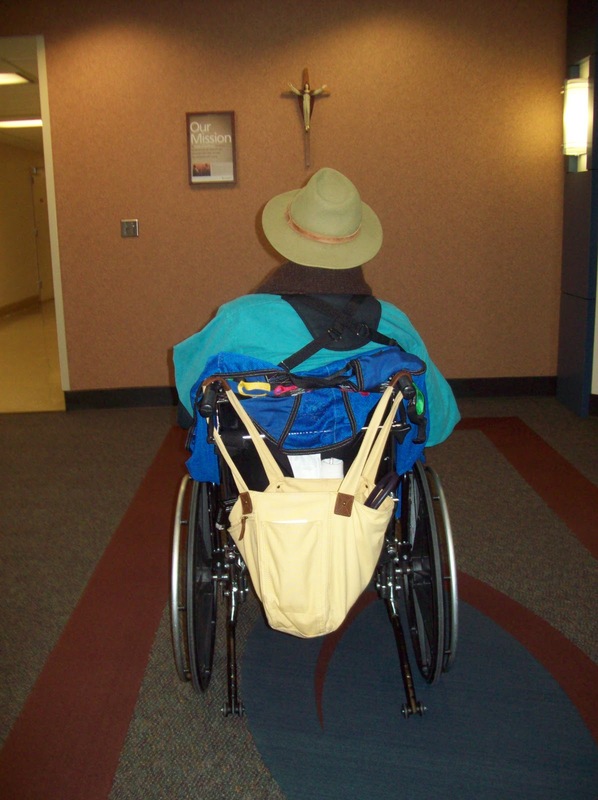 Today, Leslie wanted him to read a sign on the way to the cafe in the hospital, and he could not recognize the words on the left until she pointed to them. He tends to drift to the left, too, as he putters along (always at the slowest speed) Leslie is P.A.T.I.E.N.T........extremely patient. She waits for information to sink in before she moves on to the next activity. She is also funny, good humored, and upbeat. Stu loves her. It does my heart good to see him getting such good care. For me, these "dates" take up the better part of the day. I get there a full hour before the transportation arrives, so there is time to visit a little with Stu before getting him dressed and ready. I bring jeans and a nice shirt, a hat, a warm scarf. For at least this part of his day, he gets to look like a mensch. No sweatclothes or hospital gowns allowed! An hour before the appointment, the transportation arrives. This has been a whole oddysey in itself, just getting familiar with the companies that provide this service. I know all the drivers by name at this point: Steve, Paul, Rob, Russ, Crystal.......there are more, but you get the idea. One driver was a pro-wrestler in his former life, broke his back while performing, and (long story short) gave his life to Jesus. He was, against all odds and predictions, healed of his injuries, and he considers his work now a ministry. It was fun talking to him. One driver is a Disneyland fan----his vehicle has Mickey Mouse memorabilia everywhere in the cab. I find myself enjoying them all. During these rides, Stu sits quietly in the back of the van, in his wheelchair, which is secured with some heavy duty looking straps and metal fittings. Sometimes I sit in the jumpseat near him, if the van has one, and sometimes we hold hands. It's a date, after all. It takes at least six weeks to build a chair like the one that's been ordered for Stu. But, miracle of miracles, we've been promised a loaner chair for the interim. Not sure when it will be delivered, but soon, I'm told. 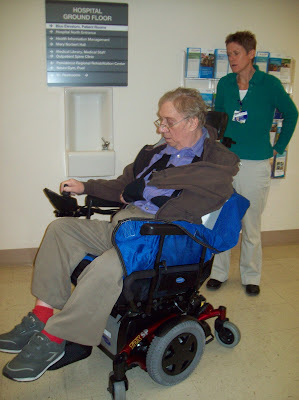 I won't say "Can't wait"-----since a lot of this saga has to do with waiting----but certainly it will be a grand thing when Stu has this kind of mobility. (Just a little factoid----Leslie informed us that a couple of her clients who live as far away as Eagle Point actually travel to the Rehab Center by back roads in their power chairs.) Wow-----the adventure continues!